This majestic lake house is an outdoor enthusiasts dream. Sited prominently on Crescent Lake with 476' of water frontage and stunning views on 5+ acres. Modern 4000+ sq ft home features four bedrooms, four baths, en-suite with balcony, built-ins and two wood burning fireplaces. Flowing open concept floor plan with porch and wrap around deck executed perfectly for entertaining family and friends. This exciting retreat is truly exceptional offering boating, fishing, swimming, kayaking and nature galore. 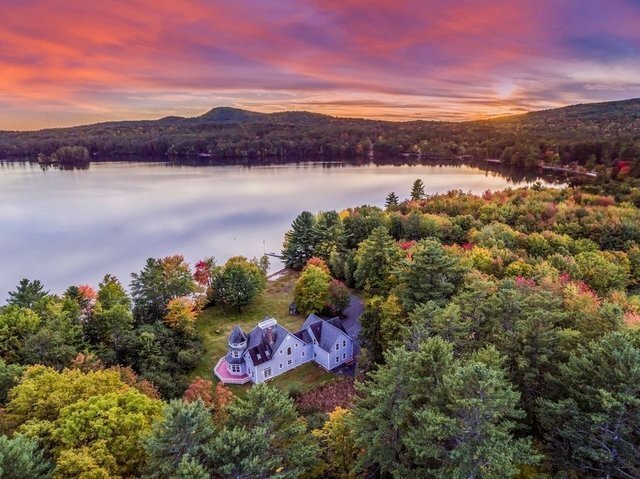 Enjoy lake life by taking in the magnificent summer sunsets, bald eagles, panoramic mountain views and experience Maine's fall foliage. Crescent Lake is known for year round fishing, sporting one of the most notable bass fishing spots in Maine.